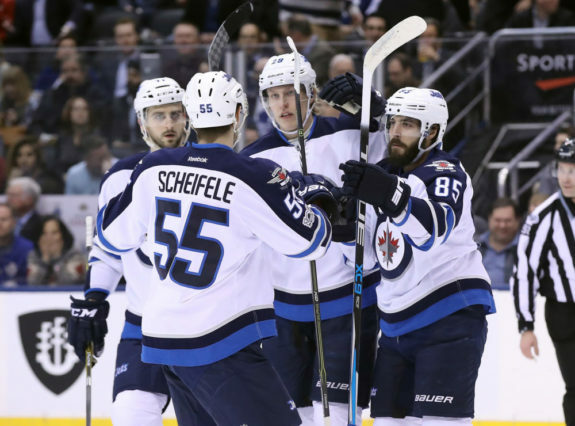 Are the Winnipeg Jets Getting the Most Out of Nikolaj Ehlers? 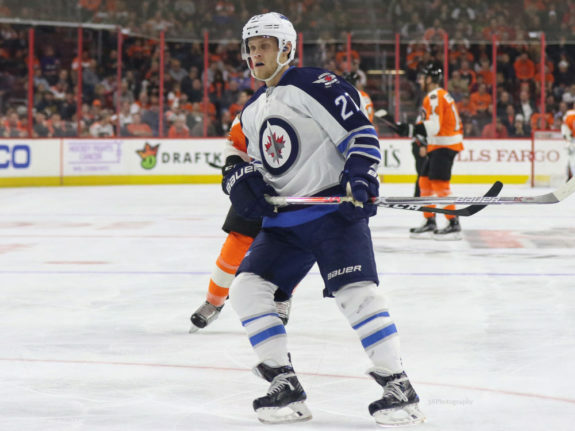 Jets Getting the Most Out of Ehlers? There’s a lot to be said about consistency in the NHL; for better or for worse, it’s nice to know what you’re paying for. We know Derek Stepan is going to score between 15-20 goals while hovering over the 50-point mark, Kris Russell will lead the league in blocked shots, and Corey Crawford is a safe bet for 30 wins (when healthy). While still only 22 years old, it’s looking more and more like Nikolaj Ehlers will be that type of player: a consistent 25-30 goal scorer while hovering just above 60 points. Let’s be clear, of course, that even if Ehlers has more or less hit his ceiling in terms of offensive production, most teams would be thrilled to have that kind of firepower suiting up for them every night. At 28 goals this year, the young Dane is tied for 30th in the league with Jamie Benn and Evander Kane. A 60-point season is what most people can expect from your average top line winger, yet the Jets have the luxury of rolling him out on the second line and second power-play unit every night. What’s more impressive is that he’s managed to score those goals while averaging just a hair over 16 minutes a night, eighth among forwards on the team. At roughly two minutes a night on the power play, he ranks 10th on the Jets and is given less time than Mathieu Perreault or Bryan Little. This is not a knock on either player or what they bring to the team, of course. Speaking of consistency, Perreault has been a perennial 40-point scorer since he left the Washington Capitals in 2013-14, and Little has managed to do the same since before the Jets relocated from Atlanta. This is simply an indication that some of that time given to players in their 30s could be balanced out a little more in favor of Ehlers, so he may continue to develop his game and push his talents to elite levels. Not a whole lot of surprises here. Before Stastny arrived at the trade deadline, Kyle Connor held his spot on the first unit, hence his seemingly high PP/TOI. Prior to his arrival from the St. Louis Blues, Stastny held a similar role on the power play but with much less effect. In 63 games with the Blues, he managed just five points with the extra man despite playing 2:44 per night. He hasn’t been an elite presence on the power play since his days with the Colorado Avalanche but maybe the Jets front office wanted to squeeze every point out of him, considering they gave up a fair amount for what will likely be a rental player. The Jets will have around $20.5 million in cap space for next season but quite a few contracts to hand out before all is said and done. Connor Hellebuyck, Jacob Trouba, and Adam Lowry will be restricted free agents next season and are due for significant raises. The following offseason will be even harder on the Jets as they’ll have to find a way to sign Blake Wheeler, Patrik Laine, and Kyle Connor. Long story short: the likelihood of Stastny returning is slim. It doesn’t make any sense to tie up money in an aging forward when you’ve got so many key pieces to sign in the near future. With a little bit of luck, Stastny’s spot on the top unit will be passed on to Ehlers. As mentioned, Connor held it for most of the season and will be his main competition for the job, but they could choose to keep Connor on the second unit as his overall production hasn’t been all that impressive considering the amount of time he’s received with the extra man. By the start of next season, Ehlers’ $42 million, 7-year contract will have kicked in with an average of $6 million per. If he maintains a similar scoring pace to the one we’ve seen in the last two seasons, that’s a pretty team-friendly deal. But more likely, we’ll continue to see his points per 60 grow, as it has from the 2015-16 season (1.97) and last year (2.68) to now (2.74). We are, however, beginning to see a peak in how much Ehlers is capable of producing in such a limited role, and a spike in power play or even strength time would be necessary for any real growth. We’ve discussed how they could include him in the top power-play unit but how do the Jets make room for Ehlers at even strength? Here lies the biggest roadblock to his success. Winnipeg has an embarrassing wealth of talented young forwards, so much so that the likes of Ehlers and Patrik Laine (a.k.a. Ovechkin 2.0) are relegated to the second line. The two have shown such great chemistry at even strength that it wouldn’t make much sense separating them. Yet, how do you take away minutes from the current top line of Blake Wheeler and Mark Scheifele? Wheeler will be 32 by the time next season begins but has shown no signs of slowing down; in fact, he’s having a career year with 66 assists and 86 points (and counting). Scheifele has produced at over a point per game over the last two seasons, and frankly, if it ain’t broke, don’t fix it. At the end of the day, that’s what makes the Jets so potent. If one elite forward hits a slump, there are plenty more in the lineup to pick up the slack. We’ll likely have to wait for an injury before we see Ehlers receive a significant rise in ice time. His only chance to hold onto it in that scenario would be to perform so well that they couldn’t bear to demote him once the injured party is ready to return. Make no mistake; Nikolaj Ehlers is a point per game player waiting to happen, Winnipeg just hasn’t the room to let it happen yet.